Looking for some fun fall family activities that stimulate brain power? These educational fall crafts are perfect for all ages. That means that you can do them right alongside the kids and teach them something while you’re at it! Using found materials is a terrific way to help kids learn about nature. You can talk about why trees lose their leaves, teach kids to recognize different kinds of leaves, or even discuss what makes leaves different colors. After your educational nature walk to gather materials (possibly from your own yard), you’re ready to craft. Each of these 3 craft projects use leaves in different ways, so if you don’t want to make this exact project, you could still use some of the methods for projects of your own. Step 1: Go for a walk to find your leaves and the pine cone. The leaves are going to be the turkey’s tail feathers, so a variety of colors is good. You will want enough leaves to create a fan shape behind the pine cone (which will be the body). Step 2: Take the leaves and pine cones home, clean them off, and then let them dry. If you don’t want them to curl as they dry, flat on top of them like a plastic cutting board. Beware that they will become brittle as they dry! Step 3: Once the pine cone is dry, paint two of its scales white to look like eyes. Be sure to leave a space between them. You can add black paint and a pupil if you want to get fancy, but the white by itself works fine and keeps it simple. Step 4: Rinse the brush thoroughly. Then, paint one scale below the eyes yellow for a beak. Step 5: Fold two scales at the bottom down and paint them yellow, as well, to make feet. If the pine cone does not want to bend, you can skip that step and go straight to painting! Step 6: While the pine cone dries, arrange the leaves into a fan shape. You can also play with how they overlap. If you start with the outside leaves and layer to the center, the inside leaves will be more visible. If you reverse which leaves go on top, the outside leaves will be emphasized. Try putting the leaves in different orders until you find which way you think it looks best. If you have a lot of wide leaves, you might even want to tear some into pieces to give more variation. Step 7: Use the hot glue gun to glue the leaves together. Make sure you only glue where they will overlap, or the glue will show on the final product. Step 8: Glue the fan to the back of the turkey so that it looks like the turkey’s tail feathers. Now, you have a complete leaf turkey! Leaf turkeys are simple yet fun, and they don’t take very long to make. You might even try making several in different sizes to create little leaf turkey families! *Just remember that the leaves are going to be very brittle, so they aren’t the type of craft that you save for next year (unless you treat the leaves first). Leaf stamping is a great m ethod for using leaves in crafts, and it works exactly the way it sounds – you use leaves as stamps. Depending on the type of paint you use, you can stamp almost any material: paper, cloth, wood, metal, glass, or even concrete. 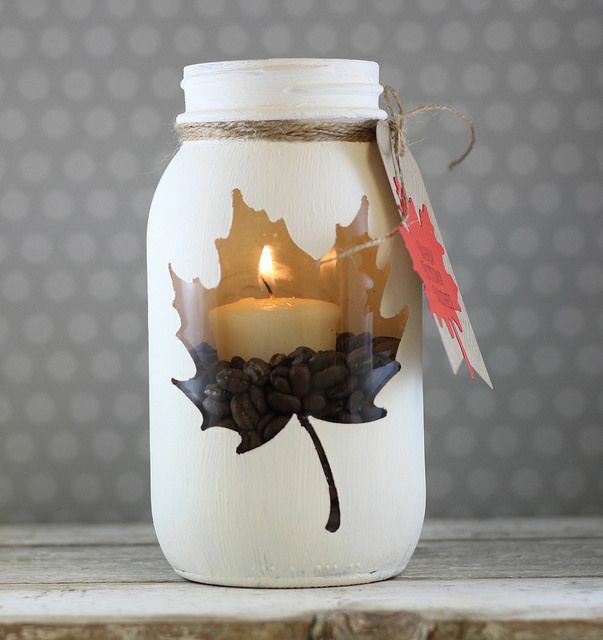 For this craft, try stamping a clear glass votive holder. You can use regular acrylic pai nt or even glass paint to create etched, clear, or metallic effects. Most craft stores keep all those options readily available. Using a lot of paint on the leaf can create a solid silhouette, and using less paint can capture the veins that run through the leaf. 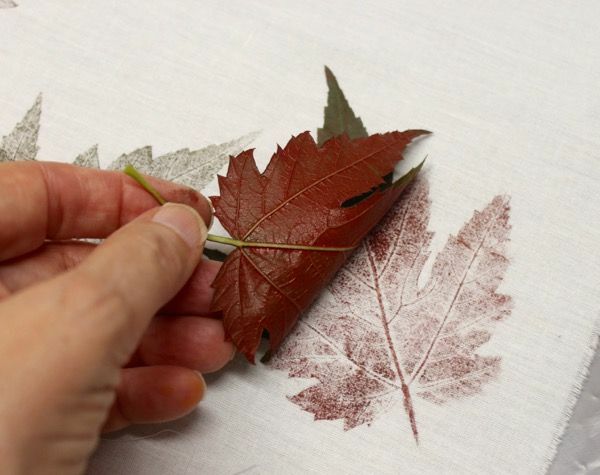 You may want to try different methods for applying paint to the leaf (dipping, brushing it on, etc.) and stamping on paper a couple of times to see which method you prefer before stamping the glass. You can even stamp with multiple colors at once or stamp with a different color after the first application dries (that’s what I did in this leaf stamped candle holder). 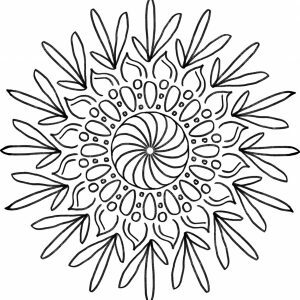 Leaf stenciling uses the leaf as a stencil to create an outline. You can draw around them with markers, paint the edges, or spray paint around them. Each method has a unique style, so pick the one that you like best! What makes pumpkins educational? Well, it depends on what you do with them. When you use them in crafts where children get to make decisions about design and color, you’re helping the child develop critical thinking and decision-making skills. After all, the arts help brains grow! These pumpkin crafts are especially good for history, literature, creative writing, geometry, and even astronomy! Making pumpkin people to decorate your yard is a fun craft for the whole family. All it takes is some old clothes, stuffing material (like newspaper, straw, or plastic bags), some pumpkins, and a little paint. Step 1: Pull out some old work clothes that you don’t mind leaving outside and create an outfit (1 outfit per pumpkin person). You could even use old Halloween costumes to add a bit of character! Step 2: Stuff the old clothes with the newspaper, straw or plastic bags. You may want to tie the ends of the clothes to keep stuffing from falling out. Step 3: Buy enough pumpkins to use as heads. They don’t have to be round – funny shapes can make very fun heads for pumpkin people! Step 4: Paint faces on the pumpkins. Some people leave the stem face up. Others use the stem as the nose. You can paint the face on any side of the pumpkin you like! Step 5: Set up the heads and clothes in your yard. The pumpkin may need to rest on something besides the clothes, and the clothes will need to lean on something to sit up. 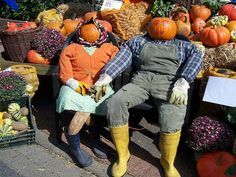 Pumpkin people are often put on benches or haystacks, but you can put them wherever you think they look best. If you want to tie a lesson to this craft, talk about the purpose of scarecrows in farming or use the discussion to introduce the child to the Wizard of Oz books by L. Frank Baum. If you’re looking for a fun way to create creepy creatures (or cute ones) without carving a pumpkin, all you need is a handful of pumpkins, some brushes, and some paint. And if you pick the right pumpkins, you don’t need to be a great artist. For example, with this sea serpent or dragon, a single coat of purple paint made the head look very dragon-like simply because of the color and the bumps! See how you can put several pumpkins next to each other and uses paint to make them look like part of a whole? Or you can just paint one pumpkin or even make a cluster of monsters. They can be as simple or complicated as you want, and because they haven’t been cut, they can last longer in-doors (Or outdoors if you use water-proof paint). If you’re looking for pretty, rather than scary, why not carve pumpkin or squash lanterns instead of jack-o-lanterns? In some ways, carving simple geometric figures like rectangles and triangles is easier than carving a face, and the resulting lantern can make a pretty addition to any fall porch or table decorations. We chose to carve a white pumpkin, and the color and design makes it more pretty than spooky. If you’re worried about having the kids carve the pumpkin, let them draw a pattern on the pumpkin and then carve the sides out yourself. You can also carve the outside before cutting a circle in the top and removing the seeds – that way, the pumpkin can resist better (but never use too much force with a knife because that’s dangerous!). If you’re a more adept carver, try smaller and more intricate geometric patterns. 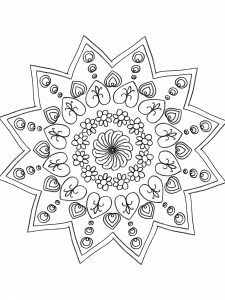 Carvings inspired by stained glass, henna, or similar designs could be gorgeous even at a larger scale! This is a fun fall activity for the amateur astronomer. It’s also a fantastic way to teach kids about constellations while also making pretty decorations. For this craft, print the constellation and tape it to your pumpkin (or draw it on if you’re not too worried about it being recognizable). Then, poke holes in the sides where each star would be in the constellation. You could try cutting out small circles by hand, but I think a nail and a hammer might work even better, especially since you can put the holes right through the paper. We enlarged ours with a screwdriver and a small knife after they were placed. Once the constellation or constellations are finished, prepare the pumpkin as usual (cut off the top to remove the innards). If you want, you can also paint the pumpkin black or a dark color to make the stars stand out even more. The deep purple not only set off the stars but also turned the pumpkin into an attractive bit of decor even when unlit. If the other craft options are too ambitious for your schedule, there’s always coloring! 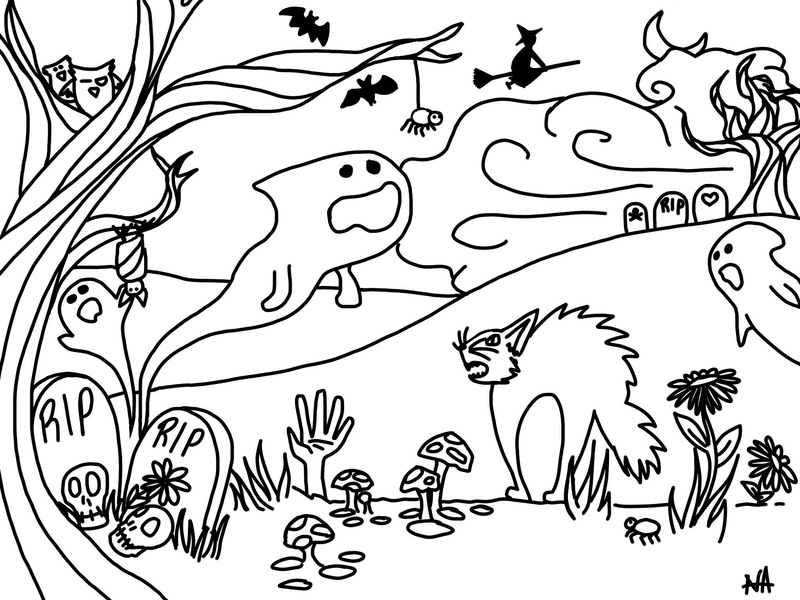 These free coloring sheets were drawn by our own Nicole Acevedo to celebrate fall holidays like Diwali, Halloween, and Thanksgiving. And if you want to try a little origami, two of the designs are square so that kids can color the designs and then fold them to make paper balloons. Which of these is your favorite? Share pictures of the ones you try!